As you have noticed, I have been absent from the blog for a while. Most of you know that I am in crunch time with exams, assignments, and papers, which I am trying to squeeze in to the time I have left between teaching cooking classes and parenting my suddenly needy (now why would that be?) children. That begs the question: what have I been cooking lately? Anything? Is this where Chef Heidi heads for the take-out menu? Um… I should get take-out, actually, but frankly I’m too busy to deal with it. Take out is a logistical hassle: first, try to find an eatery that suits the dietary needs of our various family members, then argue about which one of us is going to head out after a long day into the cold dark rain (or snow), fighting clogged parking lots and crowded line ups to pick up said meal – and if it’s me, the kids want to come too. In a word, exhausting. AND take-out is expensive. No, I’d rather come home and stay home and live on eggs and toast. An invention of my husband’s (who swears he copied me doing something similar – he’s probably right, but I don’t remember) this is a definite family favourite. The kids fight over them. 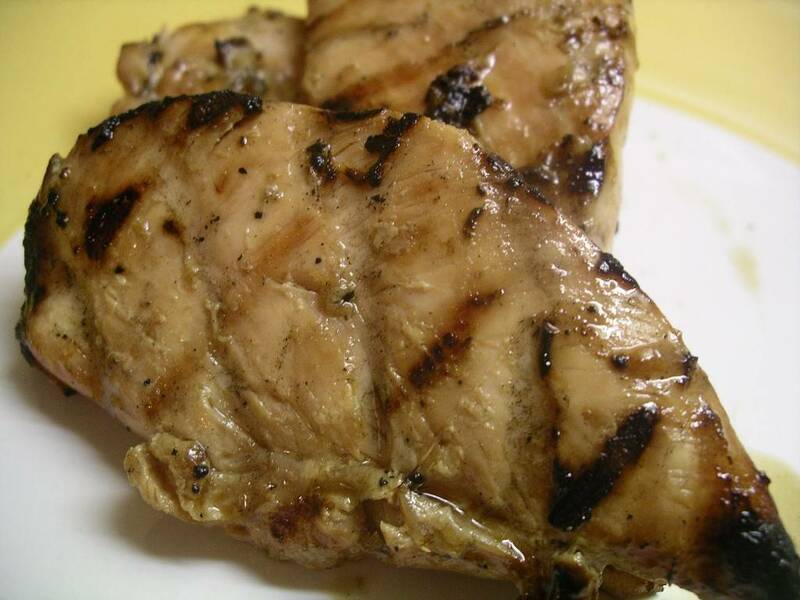 The measurements for the marinade are approximate and can be changed to suit your taste. The marinade (more of a brine, really) also performs a miracle on strong-tasting fillets of previously-frozen sockeye (the kids are not so thrilled with the flavour of sockeye that’s been in the freezer for a couple of months). In a medium bowl, whisk together the maple syrup, soy sauce or tamari, oil and garlic (crush garlic with a garlic press or mince very finely). If using chicken: Remove the ‘tender’ from the chicken breast, if it is there (sometimes breasts don’t come with this, but just in case: the ‘tender’ is the smallish elongated-tear-drop piece of meat that easily comes off the under-side of the chicken breast). Put the tenders in the marinade. Cut the remaining breast into 2 or 3 lengthwise strips (depending on the size of the breast) and put those in the marinade as well. Stir to mix well. 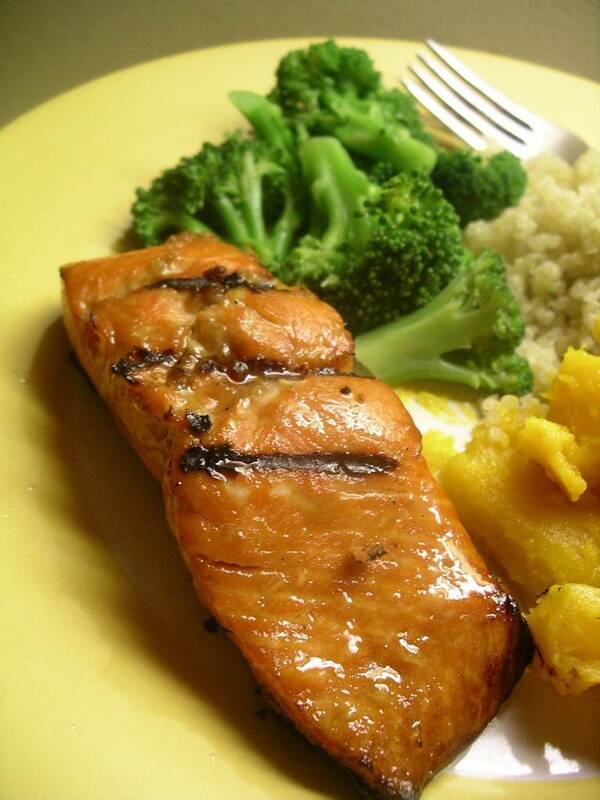 If using salmon: cut the fillet into serving-sized peices (about 200 to 250 gm each) and place in the marinade. Stir well to coat all the pieces with the marinade. Let the chicken sit 30 minutes to 3 hours. Let the salmon sit 20 to 60 minutes. (Use this time to put on the rice or quinoa or sweet potatoes and make up a veggie plate or some steamed broccoli or whatever. Also: hound children to empty their lunch kits, pick up their coats, wash their hands, set the table, and stop downloading crap games onto the computer). We always grill the chicken or salmon on a medium-hot barbecue, but you can also broil it in the oven on a broiler pan. Only do 3 to 4 minutes per side on the barbie, maybe 4 to 5 minutes per side under the broiler; serve immediately. And make sure you get your share before the kids eat it all! I’m sure you’ve had a similar meal for dinner before, but I wanted to let you know that you are not alone. And that it can actually be a favourite meal if you have really good ingredients. Heat oven to 350 F. Wrap the stack of tortillas in foil and place in the oven to warm up. Open the jar of salsa and pour half of it into a small serving bowl. Stir in the chopped fresh cilantro. (This is my trick to making store-baought salsa taste like fresh homemade salsa). Put the crumbled or grated cheese into a serving bowl. Put the chopped avocado into a little serving bowl. Don’t worry about the avocado going brown – will be fine for the next 15 minutes or so. Crack the eggs into a mixing bowl. Add the salt and 2 tablespoons of water or milk. Use a fork to whisk the eggs until the whites and yolks are mixed together and the eggs are an even yellow colour. Heat a large skillet over medium heat. Add the butter or oil and let it heat. Pour in the eggs. Use a heat-proof rubber spatula or wooden spoon to stir the eggs occasionally while they are cooking so that the eggs cook into nice big fluffy scrambly curds. When the eggs are finished cooking, dump them into a serving bowl. 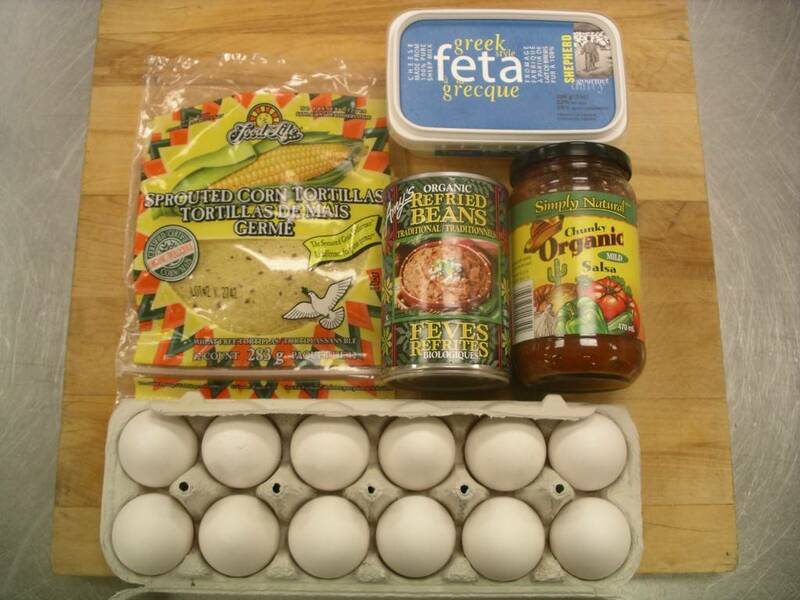 (You can also make fried eggs for your family, if that’s what they like better). 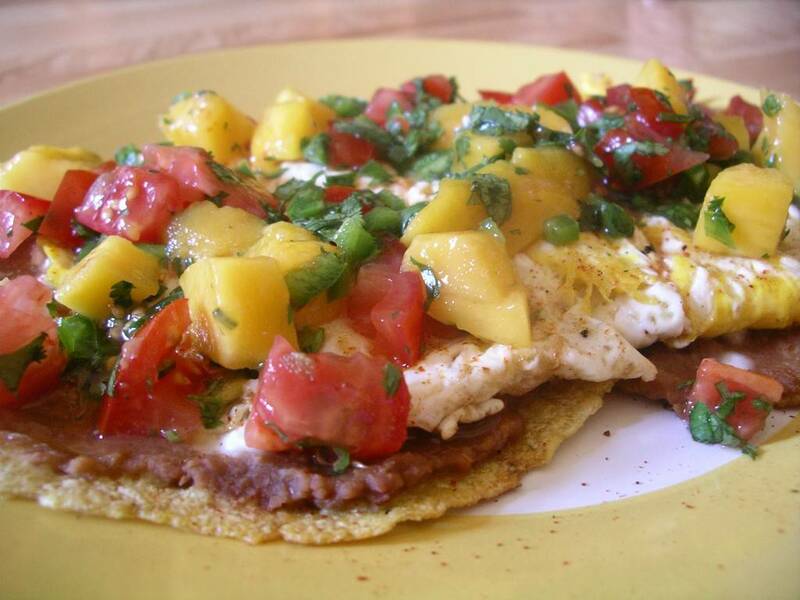 Place everything on the table and let each person build their own taco in warm tortillas with beans, eggs, salsa, cheese, and a sprinkle of the optional toppings. My sister, also a busy mother and student, once told me that quiche was one of her quick-and-dirty meals. I thought she was out of her mind, honestly. Anything that involves making pastry and pre-baking a pie shell does not count as quick-and-dirty in my books. She finally admitted to using store-bought pie shells (this is tantamount to admitting to adultery in our triple-generation-pie-contest-winning family). But, she was right. With the pastry out of the way, quiche is super quick and super easy; very filling; and my kids love it. While I haven’t yet stooped to store-bought pie shells, I did hold a pie-making class a few weeks ago and ended up bringing home two pre-baked pie shells that I had made in class to demonstrate how to “blind bake”. So quiche it was for dinner the next evening. And I loooved being able to take quiche for lunch a few days that week, too. Cut leeks lengthwise from top to root, but leave the root intact. Run under cold running water to remove the grit. Shake dry. Slice leek crosswise into 1/4-inch thick slices. Heat a skillet over medium-high heat. Add the butter and let melt. Add the leek and saute, strring frequently, until leek is tender, about 5 minutes. Add thyme and stir until fragrant, about 20 seconds. Scrape leeks into pie shell, spreading evenly over the bottom of the shell. Add crumbled salmon and cover the bottom evenly. In a mixing bowl, whisk together the whole eggs, egg yolks, milk, cream, salt and pepper. Pour this mixture into the leek-salmon-filled pie shell. Place filled shell in the oven on centre rack and bake for about 35 minutes, or until outside of custard is set but centre jiggles like jello. Remove to rack and let cool about 20 minutes before eating. 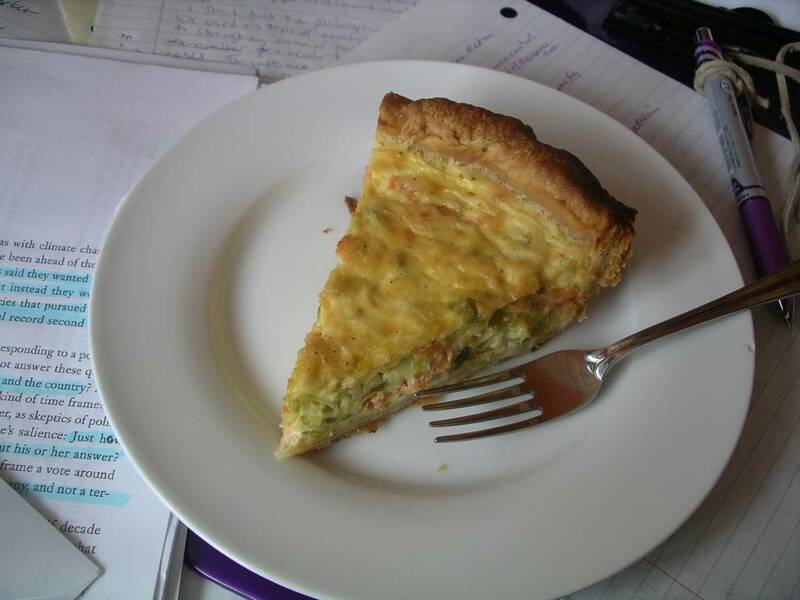 Salmon quiche with a side of homework. Hey Heidi, thanks for the tips for busy moms/parents. 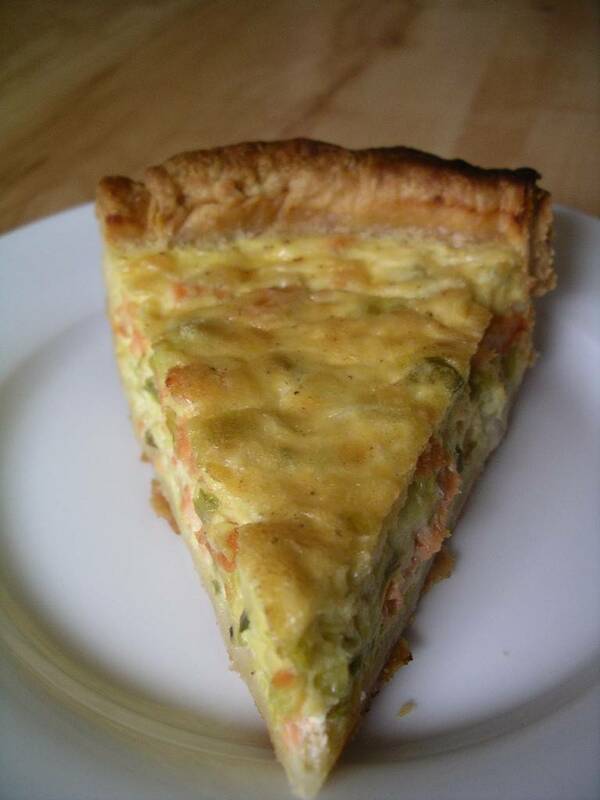 I make quiche even easier…forget the crust completely. I grew up with crustless quiche (some may call it egg pie). I have to agree…quick, easy and yummy. And, so good for leftovers or breakfast too! As for refrieds…have you tried Herdez? They are not organic, but yummy and vegetarian. My fave are the black beans, but the pintos are pretty yummy too. Take good care…congrats on surviving school.